Stylish Star Allu Arjun’s Naa Peru Surya- Naa Illu India pre-release event to be organized on April 29th at Gachibowli Stadium is going to be a grand gala with many celebrities making their presence for it. Allu Arjun’s favorite cousin mega power star Ram Charan will be gracing the event as chief guest. It is not a regular pre-release event, as many surprises are in the offing for fans and movie buffs. Naa Peru Surya Pre-Release function will be celebrated in never-seen before manner with many unique programs. “From kids to youth to family audience, everyone will enjoy the function,” inform makers. Moreover, it will be an eye feast for fans and others to watch Allu Arjun and Ram Charan together at the event. 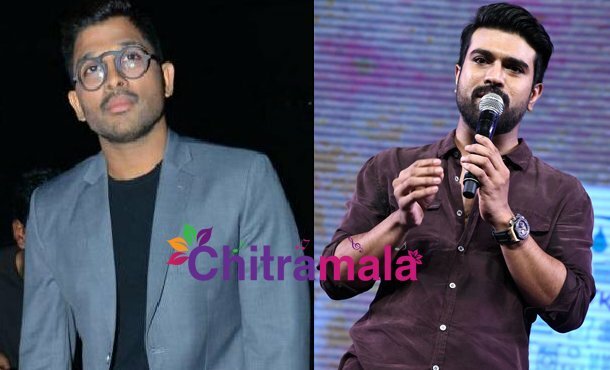 Bunny stopped all promotional activities of his film Naa Peru Surya temporarily as not to disturb promotions of Charan’s Rangasthalam which is now a huge blockbuster and is running successfully with packed houses even in its fourth week. So, Naa Paeru Surya promotions kick started with audio release event that was organized recently at a village called Military Madhavaram. In fact, Bunny and his makers intent was to celebrate first event of the film at a place belongs to army. Ane Emmanuel has essayed Allu Arjun’s lady love in the patriotic film that marks directorial debut for Vakkantham Vamsi. Sirisha Lagadapati, Sridhar Lagadapati, Bunny Vasu and Sushil Choudhary are jointly producing the film under Ramalakshmi Cine Creations Banner, while K. Nagendra Babu is acting as presenter. Bollywood music duo Vishal-Shekhar renders music for the film features Arjun Sarja and R. Sarathkumar in supporting roles. Kotagiri Venkateswara Rao, Rajeev Ravi and Rajeevan are the editor, cinematographer and art director respectively. Naa Peru Surya has completed all the formalities including censor and it received U/A certificate. The film will release worldwide on May 4th.